Earth Faerie Momma: Why Use Solar Energy? The sun is a massive ball of energy and it only makes sense to utilize it. There are many reasons to use solar energy especially if you are a homeowner. Once you get past the initial cost of getting your system set up, it is nearly free! It is better for the environment than power plants. Solar power is clean. You can have a warm home in the winter and a cool one in the summer with almost no impact on the global climate. It can reduce your utility bills. With the cost of electricity going up who wouldn’t want to save some money? Over 50% of your electricity is going towards heating and cooling. It can increase the value of your home since solar power lowers your heating and cooling cost! Some states provide tax credits. You may even get incentives from your utility company. You will be self-sufficient. No more losing power during a bad storm. Remember the sun is one of the most dependable things in our lives. You can rely on it for years to come. Have solar electric panels installed today. With Baker Electric’s monthly payment plan there won't be any initial cost. You can actually start saving money right away. I love these examples here. 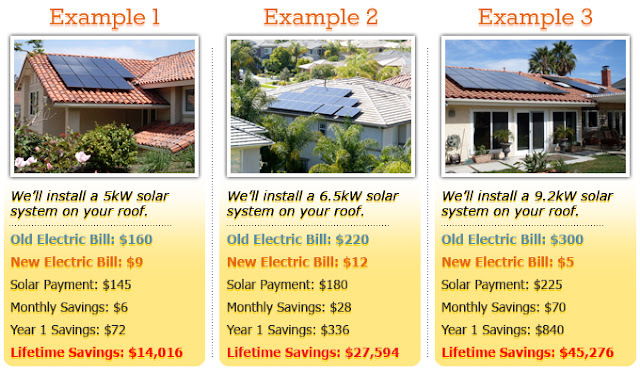 You can pay off the cost of the solar panels in replacement of your monthly bill. Then once you're done, your energy is almost free.